This sticker can be stuck everywhere, including on the body or the window of your car, it's waterproof and UV resistant. 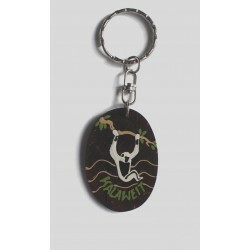 It's size is 11 cms x 9,5 cms. 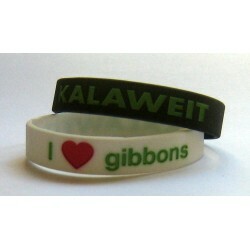 Bracelets kalaweit I "love" gibbons,Inscription hollow.Exists in black or white,In small or large size. 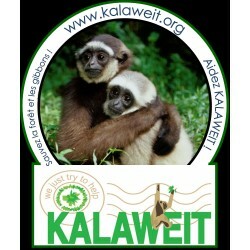 Here Wawa , the gibbon plush which will also be the ambassador of Kalaweit ! The teddy was made especially for Kalaweit and we are delighted to offer this plush. 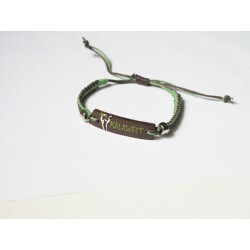 Donate for Kalaweit ! 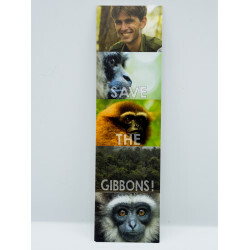 Employees, vetenary fees, aviaries.... Kalaweit it's a big team and infrastructures to help and take care of gibbons ! 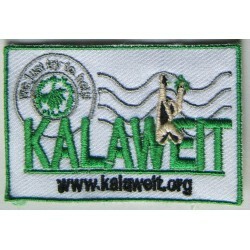 Attractive badge Kalaweit, embroidered, cloth badge of 7,5 cms on 5 cms.To sew on a jeans, bag or on a coat, as you wish. Resist machine washes.Made in Indonesia. B & C , 100% cotton (145 gr) .white markings, different front and back. Sizes available : S, M, L et XL. They are fitted small.